We love this refined Oasis Blue Invitation from our Prentiss Douthit collection shown with a clover motif and paired here with a Victorian-era enamel clover pin. The four-leaf clover is universally accepted as the symbol of good luck. Each leaf represents something unique: The first is hope, second is faith, third is love and the fourth is luck. 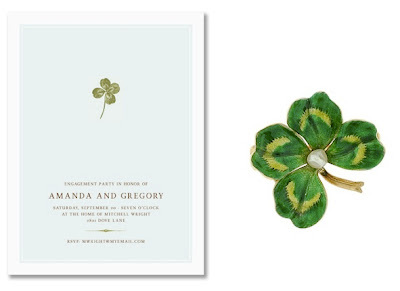 The four-leaf clover is a fitting motif for inviting guests to an engagement celebration, rehearsal dinner, bridal shower or birthday celebration. June is the perfect month to find a four-leaf clover in the grass (if you're lucky) or in your mailbox (if you're even luckier)!